62445301681 ;jsessionid=1017910tu5id1acqaqsr262yzkx6kc.10179?wicket:interface=:0:beta-club:modal-container:modal-content:content:body:login-rixty-form:visibilityContainer:fbconnect::IActivePageBehaviorListener:1:2&wicket:ignoreIfNotActive=true It seems like your browser is preventing Facebook Authentication. This happens when your browser's Tracking Protection is enabled. To continue logging in via Facebook, please turn off Tracking Protection or use a different browser. 62445301681 ;jsessionid=1017910tu5id1acqaqsr262yzkx6kc.10179?wicket:interface=:0:login-panel-small:login-small:login:modal-container:modal-content:content:body:login-rixty-form:visibilityContainer:fbconnect::IActivePageBehaviorListener:1:2&wicket:ignoreIfNotActive=true It seems like your browser is preventing Facebook Authentication. This happens when your browser's Tracking Protection is enabled. To continue logging in via Facebook, please turn off Tracking Protection or use a different browser. 62445301681 ;jsessionid=1017910tu5id1acqaqsr262yzkx6kc.10179?wicket:interface=:0:login-panel-small:login-small:signup:modal-container:modal-content:content:signup-form:fbconnect::IActivePageBehaviorListener:1:2&wicket:ignoreIfNotActive=true It seems like your browser is preventing Facebook Authentication. This happens when your browser's Tracking Protection is enabled. To continue logging in via Facebook, please turn off Tracking Protection or use a different browser. 62445301681 ;jsessionid=1017910tu5id1acqaqsr262yzkx6kc.10179?wicket:interface=:0:redeemcode:modal-container:modal-content:content:body:login-rixty-form:visibilityContainer:fbconnect::IActivePageBehaviorListener:1:2&wicket:ignoreIfNotActive=true It seems like your browser is preventing Facebook Authentication. This happens when your browser's Tracking Protection is enabled. To continue logging in via Facebook, please turn off Tracking Protection or use a different browser. 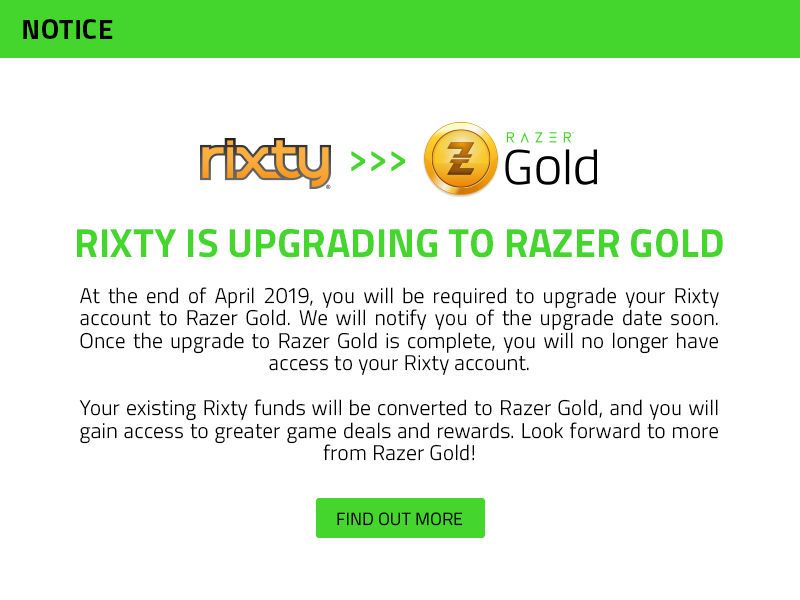 Rixty, a Razer subsidiary (1337.HK), is a leading cash-based alternative payment platform for online games, virtual goods and digital content. Consumers can pay without a credit card and without exposing confidential information by converting cash to Rixty value at 140,000 stores in the US and Brazil and hundreds of thousands of locations worldwide. Online game and website publishers use Rixty to engage with and monetize a larger percentage of users. By providing cash-based consumers a safe and flexible way to pay online, Rixty helps these publishers increase sales, enable new business models and attract new customers. For information on how to add Rixty to your website, visit our Developers page.